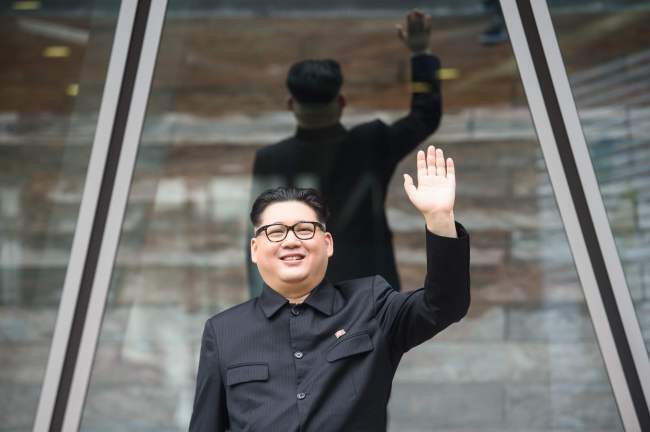 HONG KONG -- As the world awaits the historic summit between Donald Trump and Kim Jong-un, one man who has risen to prominence for his impressions of the North Korean leader is preparing for his own appearance in Singapore. The Hong Kong-based Kim impersonator, who goes by the name Howard X, will take part in an alternative summit on the sidelines of the meeting between the US president and Kim, scheduled for Tuesday. In recent months Howard has worked the international circuit and appeared at the Pyeongchang Winter Olympics alongside a Trump impersonator. There he was hauled away by police after dancing and waving the unified Korean flag in front of North Korea's female cheerleading team. Howard says the duo have been hired by a Singapore hotel to give their own take on the landmark meeting. Their aim is to encourage the public to discuss politics via satire, Howard told AFP in Hong Kong Thursday. But he admits his family have reservations about his new career path. "The first thing they said was 'Don't get killed'," Howard told AFP, adding his mother had taken out life insurance for him. Born in Hong Kong, Howard grew up in Australia and previously worked as a musician. But his impressions of Kim have become the main act since he began work as a lookalike in 2012. To prepare for each performance, Howard, who says he is in his 30s, applies foundation and trims his eyebrows, but spends the most time perfecting Kim's slicked back hairstyle with copious amounts of spray. Onstage he dresses in a black Mao-style suit with a North Korean flag pin and thick-rimmed glasses. "You could say I've been blessed with this face," he told AFP. "Kim Jong-un is president for life, unlike an American president, or other prime ministers. Career-wise, I've got a very long and profitable one." Howard says he now makes a living out of being Kim through gigs, film and commercials and has also become an agent for other lookalikes in Asia. But while his impressions pay the bills, he disagrees strongly with Kim's authoritarian regime.